These days, most Brits considering a trip to Spain make a beeline for the nearest low-cost airline. Even though once you’ve factored in all those additional costs for luggage and so on, low-cost air travel isn’t easy to find. By contrast, comparatively few give the idea of ferry travel a second thought. Perhaps for a weekend in Calais, but all the way to Spain? Interestingly, more people than ever before are giving the ferry a shot and vowing to stick with it for life. But is there any way ferry travel to Spain can really prove preferable to air travel? There is…and for a number of reasons, too. For one thing, travelling by ferry to Spain means being able to take the car along. Which in turn means that once you arrive, you’ve got all the transportation you need for your whole trip. From the road trip of a lifetime to simply getting you to and from your final destination, having your own car will save you time, money and effort. Plus there’s the way in which you’re free to stuff as much luggage as physics will allow in your car – all without paying an extra penny. Bring the bikes, bring the kids’ toys and bring pretty much anything you can think of. For obvious reasons, this isn’t something you’d be able to do with low-cost air travel. Ferry crossings may take long, but the key difference is the way your holiday starts the moment you get on-board. Bars, restaurants, shops, cinemas and so on – all the kinds of things that get family holidays off the best possible start. Of course, it’s also worth bearing in mind that when considering airport waiting times and whatnot, it’s not as if air travel is all-that fast and convenient anyway. When you arrive at your destination after travelling by air, you’re usually exhausted. If the flight was at an antisocial hour, it could wreck the first couple of days of your trip. Which isn’t great if you’ve only got a few days to play with. When travelling by ferry, you’ll have the option of your own private overnight cabin. Enjoy your evening, have the best night’s sleep imaginable and arrive at the other end refreshed and raring to go. And let’s not forget, you’re also treated to the same perks and privileges on the way home, too! As with all transport services, there are plenty of peaks and troughs when it comes to seasonal price variations. But when factoring in the car, the kids and the kit you bring along, you’ll never pay anything close to the nearest comparable airfare. 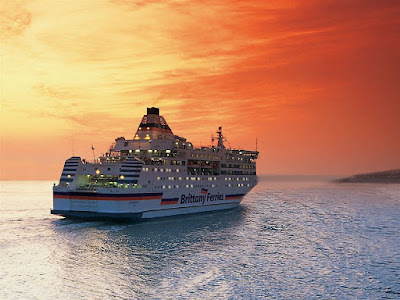 Brittany Ferries offer the widest choice of ferry crossings to Spain sailing from Portsmouth and Plymouth to Bilbao and Santander. Choose you time, your destination and enjoy the freedom of having your own transport to hit the kinds of spots the average visitor never sees. Suffice to say, travelling by ferry to the continent is the kind of thing that can become somewhat habit-forming!